Since IM South Africa it is so nice spending all my time with Dejone. With me only back at work next week Tuesday and DJ having school holiday you can say we have been glued together. Yesterday we went to the coffee shop and had a real nice time chatting about everything, just me and her. I only realize when we have these moments how much she missed me when I was spending all my Saturdays and Sundays on my long rides and runs. We stopped by the travel agent to give us a quote on the air line tickets to Kona. As Hawaii is literally half way round the world, I tough that we are in for a real shock when it comes to ticket prices. When I received the quote I was surprised as it was less than I expected especially if you see that the total flying time to Kona is going to be 27 hours. Ouch!!! Last night we both fell asleep in front of the TV watching Disney channel. This morning we went to see a movie (Monsters vs Aliens) and must say that I enjoyed it more than I though. I don't go to movies (this must have been my 1st movie in 4 months) as I can't sit still that long but it was a real treat with DJ. 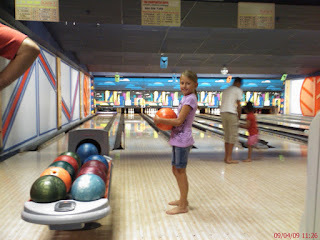 After that we went and played some Ten pin bowling and Dejone is getting better every time we play. One of these days she is going to give me a run for my money. We ended our excursion by stopping at a coffee shop and I could not believe it when Dejone didn't order her standard Strawberry milkshake and Toasted Cheese meal. She orders this every time we go out. We both had a hot chocolate and a waffle with lots of syrup and ice cream. I've decided that I am going to take it easy this week on the eating plan and will get back to my strict eating plan next week. I have also taken a few beers this week. In preparation for Ironman I stopped drinking any alcohol since January this year, must say I really enjoyed them. This weekend is going to be a nice long relaxing weekend with tomorrow and Monday being holidays. We've decided to just relax at home and if it is warm on Saturday we will have a braai (barbecue).